Wondering about the best time to visit Ooty? With near perfect weather from January to December, we’d say ‘any time’. But the seasons do vary a bit and you need to pick a time that suits you the best. So read on to find out everything you need to know about the best time to visit Ooty hill station. There are roughly three seasons in this lovely hill town nestled in the Nilgiri Hills – a mild summer, monsoon with heavy downpours, and a chilly winter that’ll trick you into thinking you are somewhere in the Himalayas. You can pick what is the best time to visit Ooty hill station for you, depending on the kind of activities you want to pack-in on your vacation. From October to February, this pretty little town is swathed in chilly winds and some days might be too nippy to venture out. 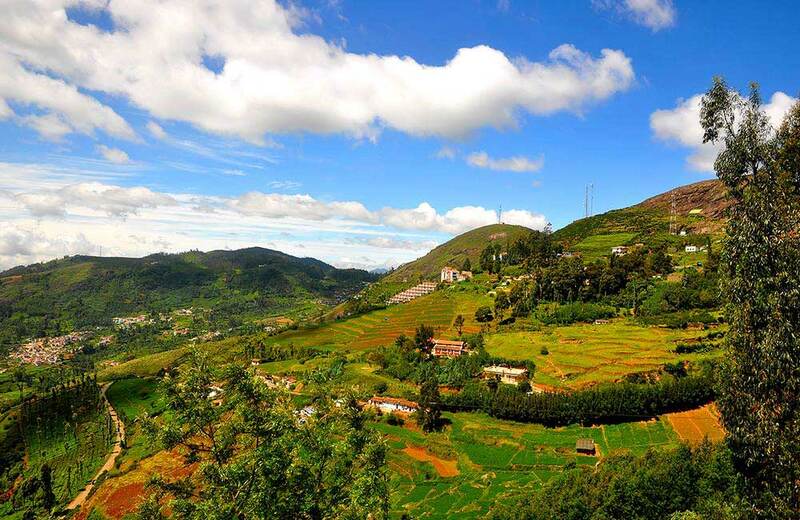 However, if you’re packed up good in a fluffy jacket, it would be the best time to visit Ooty for your honeymoon (or a babymoon, if you will!). Visit attractions like the various beautifully constructed temples and churches (we recommend the Venkateshwara Perumal Temple and St. Stephen’s Church and amusement parks like Thunder World. The town experiences a mild summer with temperatures mostly sticking around 20 degrees C from March to June. This is one of the best times to visit the Ooty Rose Garden and enjoy an amazing variety of roses – hybrid tea roses, miniature roses and even some unusual ones like the Black Rose and the Green Rose. A rose by any other name is still a rose though and just as pleasing to the senses. Summer months are light and airy and you can visit some of the town’s iconic attractions like the Ooty Lake (don’t come back without a ride on its toy train), the Botanical Gardens with more than a thousand trees, well-kept impeccable park land and a riot of colors and the Pykara Dam just a hop, skip and jump away from the city (19 km). Heavens rain on Ooty during July and September and the town is at its prettiest. Although, monsoon is heavy and consistent in Ooty and it may not be the best idea to venture outdoors. But the heavy downpour makes Ooty ideal for those who are looking for a quiet escape from city life. Spend your monsoon vacay in Ooty sipping hot coffee, eating the famed chili pakoras and gorging on all that homemade chocolate the town is famous for. Book a fabulous hotel in Ooty for the monsoon season and spend your time in delightful solitude or in comfortable conversations with your partner, all the while enjoying the scenic views of this lush, green town. As you can see, no matter what time of the year you choose to visit Ooty, you’d find yourself engrossed in something or the other. Whether you’re an adventure seeker or a laidback traveler, this hill station will mesmerize you every time you step out in the open.